First up are some beads on the Ohm Beads Ball Necklace but without the ball. I slid it off and put these beads on and they hang really well! Left to right are Milan and Ancient Palace by Trollbeads, Hive Mind and Incremental Change by Ohm Beads and Black Silk by Trollbeads. 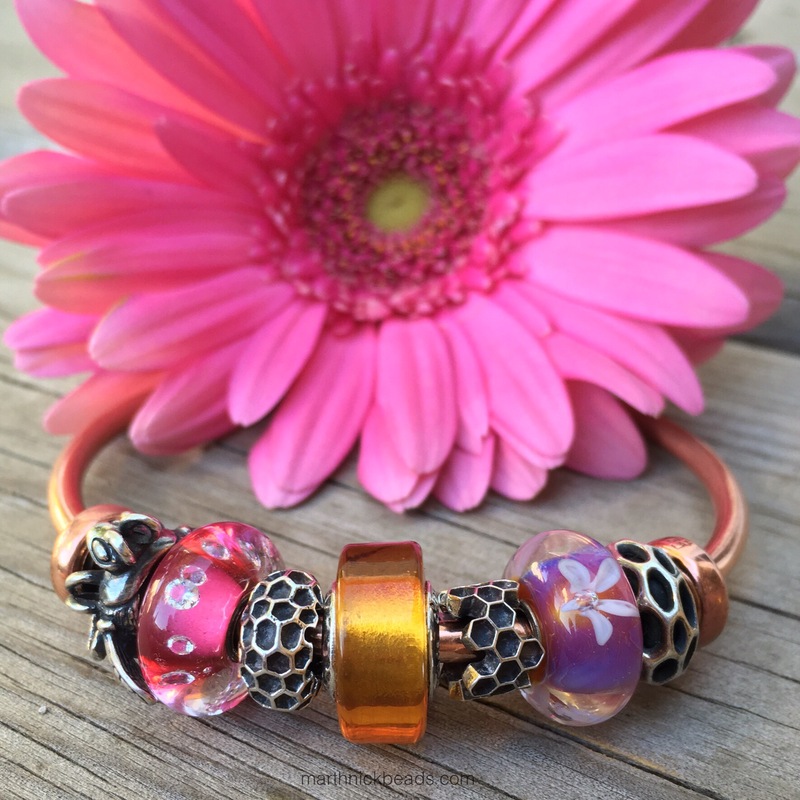 This combo is an absolute favourite as I love the honey colour with pink. There are the Trollbeads Spacers on either end, the three middle ones are from the Bee Ohm collection and then The Diamond Bead, Pink and Sea Anemone by Trollbeads. 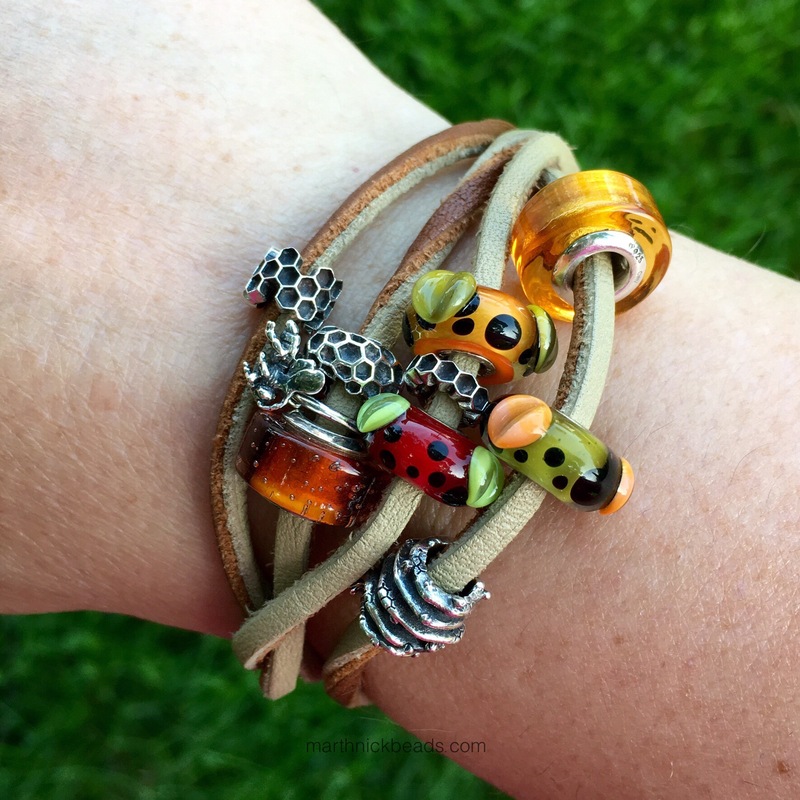 Last weekend for #weekendbeads we had a nature theme, so I put together this on a Trollbeads Leather Bracelet. 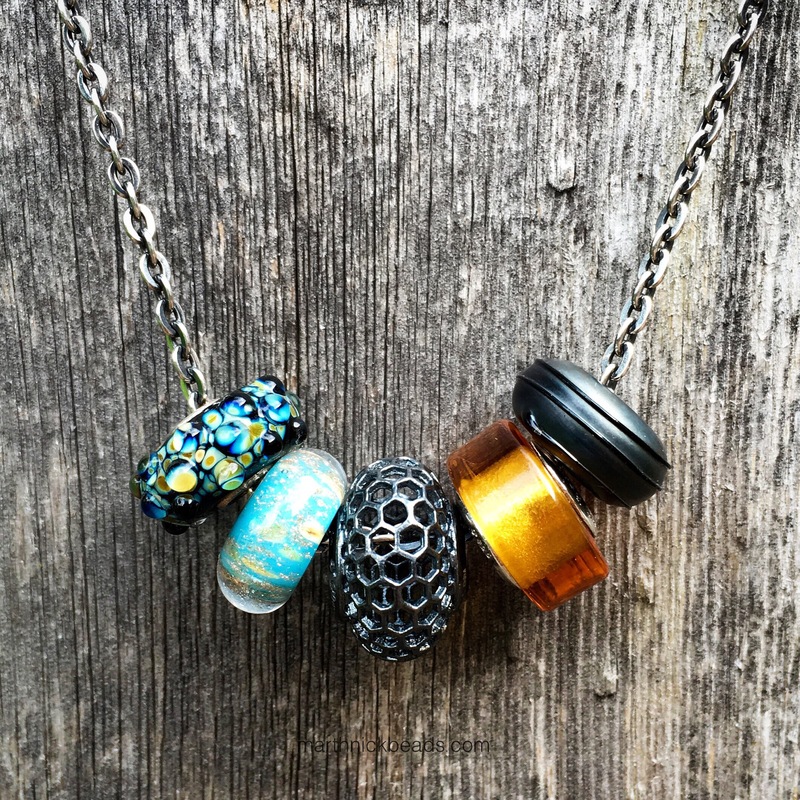 It’s all six pieces from the Bee Ohm collection, plus their Bar Brawl glass bead. 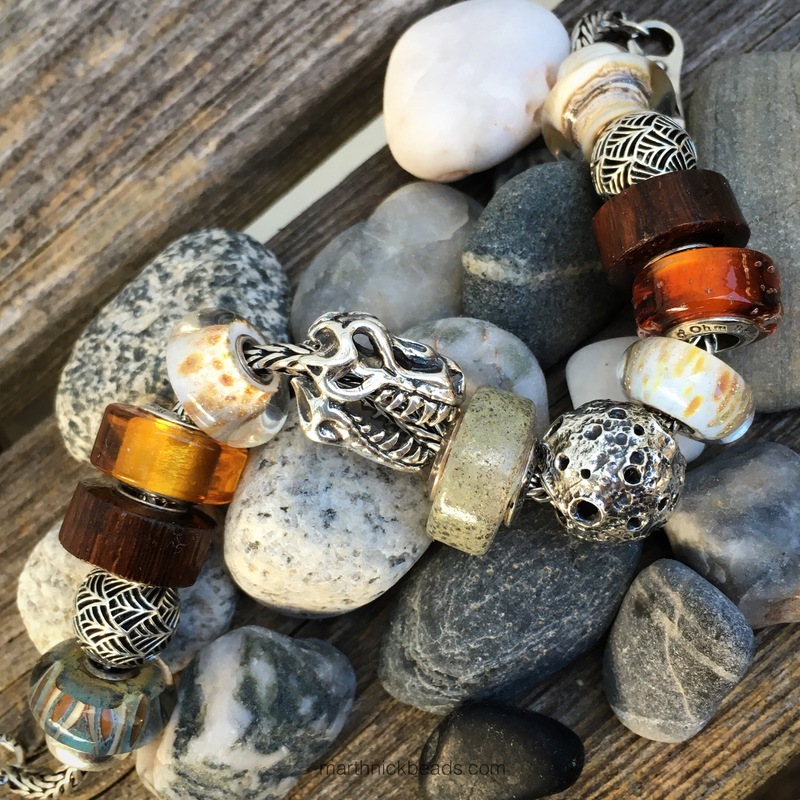 Then I threw on three Trollbeads from the retired Native Elements Kit. On the bracelet below from top to bottom are Cozy by Trollbeads, Pandora’s Tropicana, Bolly Wood and Bar Brawl by Ohm Beads, Scirocco by Trollbeads, Luna, Humerus and T-Rex by Ohm Beads, Scirocco again, Incremental Change and Bolly Wood by Ohm Beads, Pandora’s Tropicana and Sandstone by Trollbeads. Lastly, here’s a simple bangle I made up because I kept thinking that a bear would like to eat honey. I used Paula the Red Panda, even though technically it’s not really a bear, being more related to a raccoon or skunk. Left to right are Incremental Change, Live Free, Hive Mind (Blushed), Paula the Red Panda and Bar Brawl, all by Ohm Beads. So, as you can see I’ve really been enjoying playing with the honey colour and there are so many more combos to be made! Have a great weekend everyone! Coming up Monday is —- (can’t say yet-how annoying of me-sorry!) and then Tuesday and Wednesday will be Perlen’s Beauty Beads. Love the honey combinations. Looking forward to Monday’s surprise and also looking forward to the more in-depth Beauty Beads blog posts. The few images you have already put on Instagram look great! 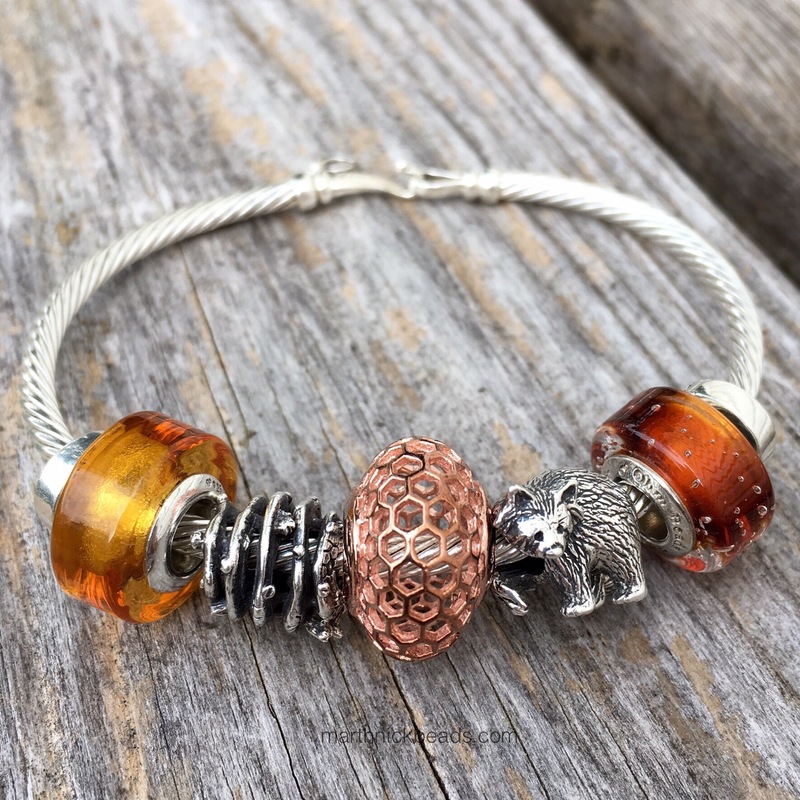 The Beauty Beads are really gorgeous and well made, in my opinion. Can’t wait to take more pictures! Your Honey combinations are all lovely, it really is beautiful. I enjoy this stroll down the lane with some of your IG photos because they are super! The copper bangle combo is my favourite combo here, and, if I see Milan one more time, well, it’s already on my list because whatsoever you put it with, it looks gorgeous. Now waiting sort of patiently for Monday.